This Week's Featured Advertisement: Three Refurbished HumanWare Smartview 360s + Rolling Carrying Case for only $900.00 USD Each!!! Flying Blind, LLC is excited to share some unparalleled holiday cheer with its low-vision subscribers this week. 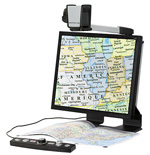 This versatile video magnifier boasts an easy to manipulate camera for desktop and distance viewing, making it the perfect companion for students, professionals, and seniors. It takes up less space than two sheets of paper, has an integrated 19-inch monitor, and offers true color and contrast modes for up close and distance viewing. Make school, work, or home related tasks easy on the eyes by opting for this gently-used, simple, but powerful solution that is also easy on the holiday budget! You save over $1,300.00 USD by purchasing one of these gems today, each of which ships for free in the continental US with its optional rolling carrying case, at no extra charge. For more information, email featured@flying-blind.com or call +1 (216) 381-8107. At this ridiculously unheard-of low holiday price, act fast, before these three units become gifts for someone else! Web Axe Podcast #96 is entitled WordPress, Events. You can read a transcript or listen to it. Viewpoints, planning to have its name changed to Eyes on Success once the new year rolls around, gives us an episode on the present and future of NVDA. Two new episodes of the Tech Doctor Blog and Podcast are on the site, one, a talk Robert Carter gave entitled "An Accessible Life for the Visually Impaired," and the other on Accessible Books.